I’m so happy you’re here. Are you excited to celebrate all things Irish and Green and Lucky with me? Do your kids love doing scavenger hunts? 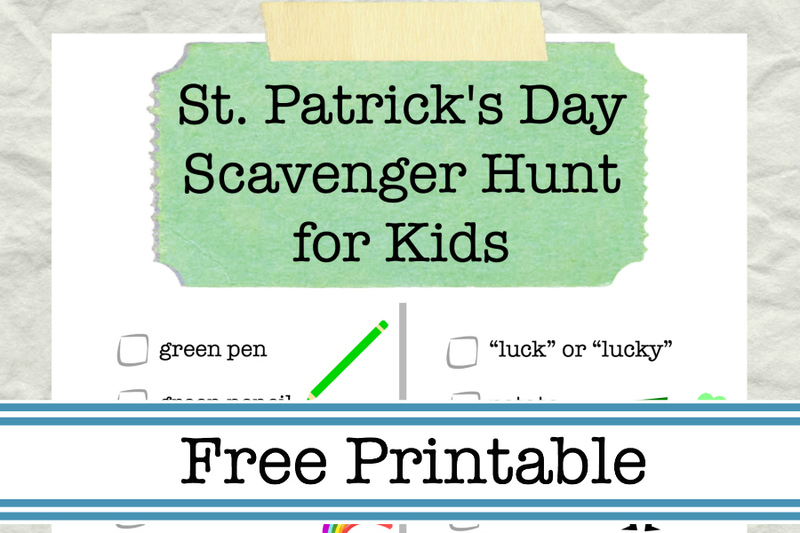 I’m excited to share this St. Patrick’s Day Scavenger Hunt Printable for kids! Did you see last month’s Valentine’s Day scavenger hunt? I’ll be bringing you a NEW, seasonal scavenger hunt each month, all year long! Whether or not you’ve got some Irish heritage like we do (from both sides, in fact! 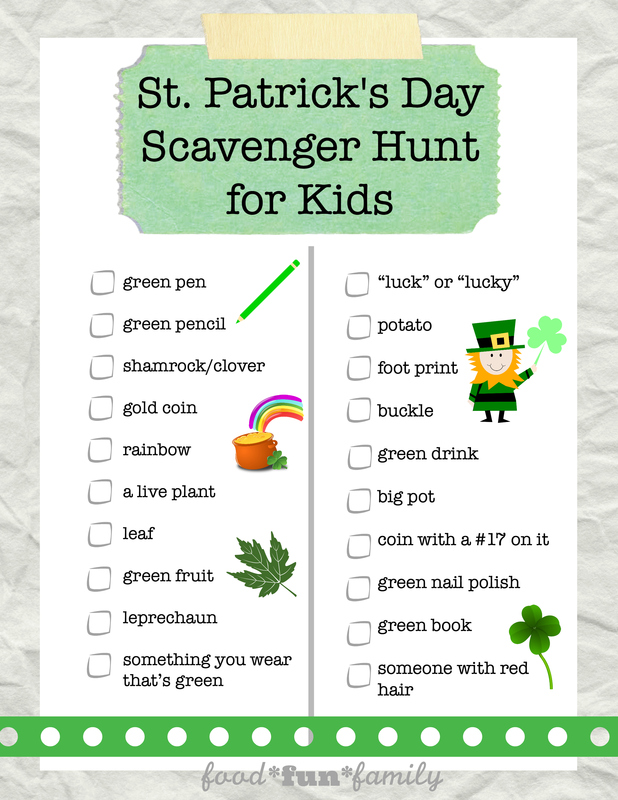 ), your kids will love searching for green things and getting in the St. Patrick’s Day spirit! The best thing about this scavenger hunt is that it can be played many different ways – use the printable list as a guide and make the game your own. Simply print off as many sheets as you need, and then go have some fun! Single-player game: race against the clock! See how many of the items on the list you can find in 5, 10, or 15 minutes. Look in the house for as many items as possible, or find things that aren’t at home in a magazine or book. Group scavenger hunt: If you have enough players, divide into 2 teams. Each team works together to find the items on the list. Reconvene at a specific time to compare what each team was able to find. Get creative! Some items are easier than others to “collect” as participants search for things on the list. Let the kids think of alternative methods of “collection” such as taking a picture, drawing a picture, or having an adult initial next to an item on the list. See ideas for gathering clues below. Broaden your search area. With parental permission/supervision, teams can ask neighbors for help gathering scavenger hunt items. Maybe you don’t have a cupid at home, but a neighbor does. Make sure that kids know to only go to houses where they know the people that live there, and always bring a buddy along. Each person or group has a small bag and collects as many items inside the bag as the can in a set amount of time. At the end, everyone shows off the item they’ve collected. Each person or group has a digital camera (phones, ipod, etc) and snaps a picture of each item they find. Simply check off each item on the scavenger hunt paper as it is found or have another person act as a “witness” and initial the paper to verify that an item was found. Use your imagination! Let the players decide the rules! Great Movies Set in Ireland by How Was Your Day? This looks like a fun thing to do. I like that you’ve given different ways of collecting the items. We have never done a scavengers hunt before but it sure would be a lot fun. What a fun way to get the kids into St Patrick’s Day! Thanks for the idea! What fun! I wonder how many of these we can find?